Google doesn’t normally play WordPress Police, but WordPress 4.7.2 was just released. 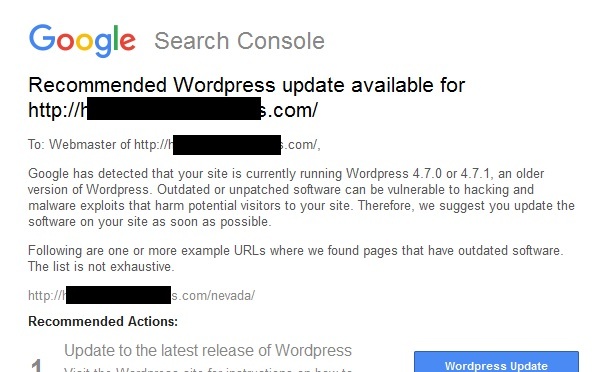 As I reported yesterday, outdated versions of WordPress are being hit hard due to multiple security vulnerabilities in the WordPress core which are now being exploited. I don’t have a problem with Google Search Console emailing these notices out, however, the website they emailed me about was already updated days before the notification went out. I was very confused at first, had to log in to Search Console and poke around, log in to the admin panel on the WordPress site and verify the site was updated, make sure the install worked properly, and then check the site for malware. I can’t imagine doing that 150 times so I just deleted all of the other notices I received from Google. I have no idea if any of them were worth a darn or not. But, I have most of my WordPress installs under control. Then again, most people do not. Google has detected that your site is currently running WordPress 4.7.0 or 4.7.1, an older version of WordPress. Outdated or unpatched software can be vulnerable to hacking and malware exploits that harm potential visitors to your site. Therefore, we suggest you update the software on your site as soon as possible. Following are one or more example URLs where we found pages that have outdated software. The list is not exhaustive. Visit the WordPress site for instructions on how to download and install the latest release. Because there was a vulnerability on your site, it’s possible that your site might have been compromised. We recommend you check your site for any suspicious activity. You can see if Google has detected any hacked content on your site in the Security Issues section of Search Console. Remember that older or unpatched software might be vulnerable to hacking or malware, so it’s important to install new software releases when they come out. Was your WordPress website already updated?